As if I could not do something mini in the garden, right? Oh Ebay, you tempted me and I caved. Miss Kitty has become an avid gardener. Thank you Peppa Pig and your gardening with Grandpa Pig episode (that we have watched a million times). 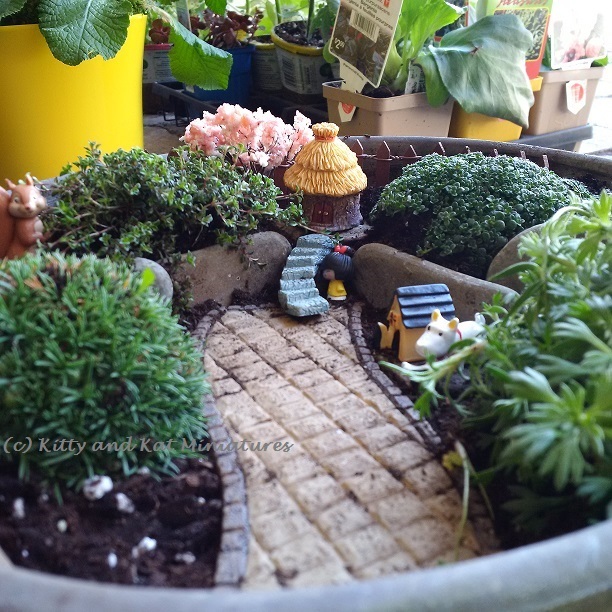 She has her shovels, her garden tools carrying bag and her Hello Kitty watering can. So, I thought, why not indulge both of us and have some fun! The pink tree, hut, stairs, fence, little girl, squirrel, and dog set all were on Ebay, usually 99 cents an item, so I didn't mind. The main stone path came from Sheridan Nurseries (never a hardship to go look at the flowers too). The pot is a few years old and the stones came straight from the shores of Lake Ontario earlier today. 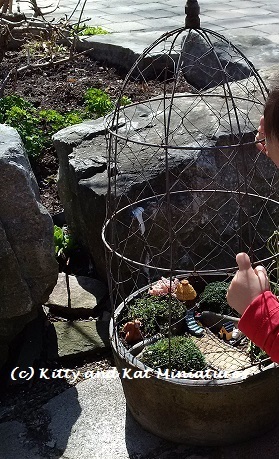 Fortunately the pot has a metal trellis-like cover which prevents little fingers from removing all the little parts, especially the squirrel, the little girl and the dog. 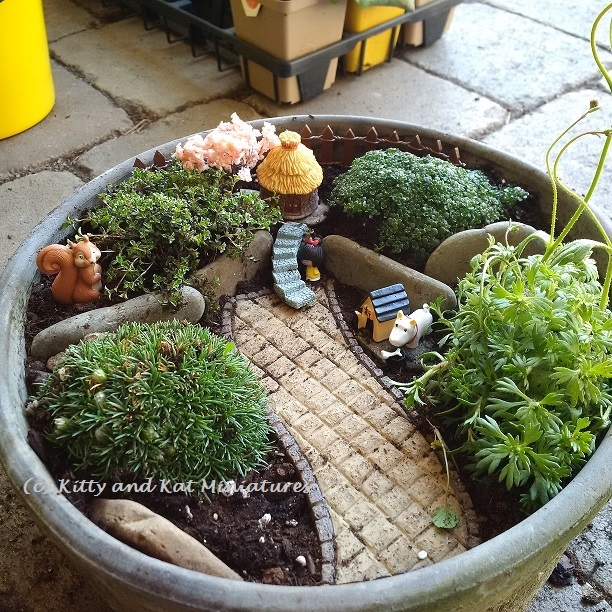 Now, I just need to figure out where this will go outside and not get flooded when it rains! 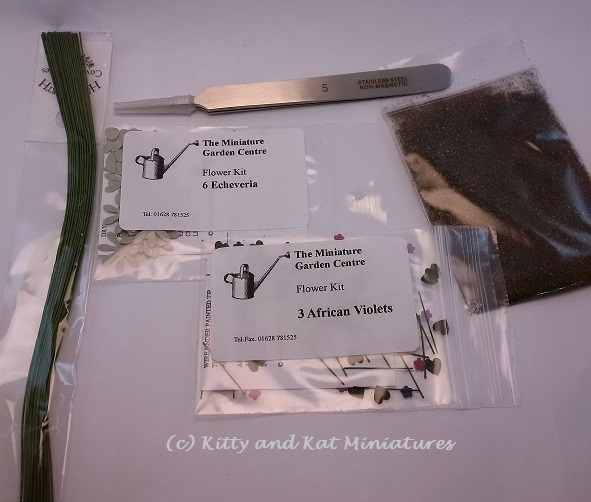 And my flower kits from The Miniature Garden arrived today!! I've never made flowers before so I decided to buy these amazing kits and the supplies (tweezers, dirt and wire). Not a "right now" project but I will be itching to start them as soon as I start planting in May. It was over 20 degrees here today, no coat and I was sweating. Yeah! for spring. Bed building phobia squashed (woo hoo). Miss Kitty's self potty training underway (check). Garden raked, lawn fertilized and front garden dug up (check), back garden soil 50% turned (check). Ok, now back to mini making and blogging! As you may recall I purchased the Ikea "Sy" sewing machine. I still love it. I think I have jammed that sucker up and done everything possible to it as I've taught myself to sew. All I can say is thank you Ikea and your YouTube tutorials. Without them, it would have been tears and a return to iron on hemming. Off to Fabricland I went! Oh, fabric scraps, how you tempt me. My fabric box is officially too small, but I now have lots of great fabrics to work with and most scraps cost me less then $2. The bedding consists of 2 items, a used pillow case and some short pile charcoal velvet. Velvet tip: since you likely need to iron it, make sure you put a towel between the iron and the velvet. NEVER iron direct on velvet or say bye-bye to its pretty appearance. Remember, I am a previous non-sewer. I'm sure this is technically atrocious for those of you good at sewing. But, if you're like me, you can do it!!! I had no flippin' clue what I was doing but it worked out. Only took me 3 hours to do it all, but I got there! Nothing beats learning to sew with your iPad. This is my pillow case. Very soft, 600 thread count, and washed a million times. The fitted sheet looked sad, but the pillow cases were just to perfect for this to pass them up. I used the pillow case for the "fitted" sheet, the top sheet and the pillow cases. 2 1/4 x 1 3/4 inches were the dimensions of the the pillows (unstuffed, just stitched). You loose a bit when you stuff them, so regardless of the dimensions you use for your bed, make it a little larger to accommodate for stuffing size loss. Cut your pieces of fabric a good 1/4 to 1/2 inch larger then were you plan to stitch. You can always trim excess fabric away, and its easier to handle a larger rectangle. Fold over 1 edge and make a simple straight stitch. This is for the open end of you pillow. Do this to both pieces of your pillow. Place your to pieces together. Ensure the raw edges of your open endd are facing out on both sides of your pillow. I used a ruler and a pencil to lightly mark my stitch lines. Sew 3 straight stitches to make your pillow. Remember, only 3! That one side is open so you can stuff your pillow case. Snip the 2 corners off so you can get sharp points when you flip the pillow inside out. Trim any extra fabric away, but not too close to your stitches. You can either make a proper pillow to stuff in your pillow case, or just jam some cotton filler in for the time being. I didn't have the time to make the extra pillow inserts! I then used little velcro tabs glued to the pillow and the mattress to ensure the pillows would stay in place when Miss Kitty played, but could also be removed and changed if needed. Cover your mattress with the pillow case material. I used Aleene's Fabric Fusion glue to adhere it to the foam core and the fabric to the fabric once I added the top sheet. Don't reinvent the wheel. When your pillow case gives you some nice banding with a rolled edge, take it and run with it! That banding became the finished edge to the top sheet as it was folded over the comforter. Voila, one less thing to sew. I decided I didn't care to ever see the top sheet separate from the comforter, so I made them one piece. The top sheet is just a "faux top sheet." Sort of like those sweaters with the white collar sewn into them so it looks like you layered, but really didn't. Sew the top sheet piece to your comforter (see picture) using a straight stitch. When you fold over the top sheet piece, it hides your stitch. I used a straight stitch on the ends to ensure the top sheet would never flip back over, but if its tucked under, you can omit this step. Purely optional. Flip the comforter over and trim off any extra top sheet material that isn't needed. I then wrapped my comforter/top sheet combo around the mattress and glued it down using Aleene's Fabric Fusion. I suggest placing a piece of plastic on the glued down side then putting a heavy book on it to weight it down. It takes a while to get the glue to set. Then, I applied (and glued) a strip of velcro to the mattress and the bed to ensure it was secure but still removable. No Sewing Machine? It's OK! I wish I could say that you could do all this with iron on hemming, but you can't. The bedding could be done, but the pillows would kill you. Burnt finger tips and you wouldn't get the crisp lines and neat corners, so your best be would be to hand stitch. As soon as I was done I wanted to make a million pillows, but it was almost midnight and I stopped myself. By the next morning, as the coffee was hitting my veins and Sesame Street was on in the background, the pillow urge had most definitely passed. Phew! 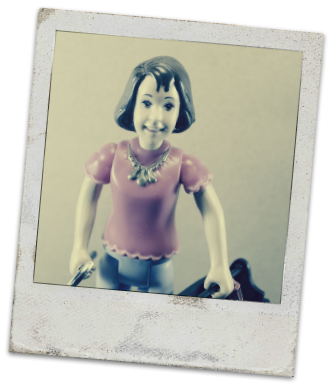 I decided to make a few changes to the blog. I really, really dislike how complicated Blogger is to work with and change formatting without advanced HTML work. I might dare to say that my husband was right when he suggested WordPress instead of Blogger, but oh no I said, and now I suffer! Grrrr. I might invest in a purchased template in the future, but this works for now! Please leave a link to your template provider if you purchased one, I'd love recommendations. I really wanted something not as horrible as my old header. Trying to find the correct free online software was a pain, not to mention figuring it out, editing the pictures, and then reinserting the edited pictures back into the header design. I used Picmonkey.com. You don't have to sign in and all the features you could really need are free. You can save direct to your computer too. You can insert your pre made header image in your header gadget, just click "instead of header and description." Into your gadget title. As you might have discovered, you can't not have a title or the red error message pops up. This "title" tricks it and its gone. But you might have to re-enter it every time you mess with that widget. They were free from Brandi Hussey. They come in a few colours and you can download them as a .zip file. Inserting them is much easier then the 45mins it took Googling how to do it! The Mini Me is actually the "You and Me Happy Together Family Dolls - Ethnic Family" from Toys R Us. 1:12 scale and the legs and hips are articulated!!! I had to buy the "ethnic" family to get brown hair, as the caucasian family was blonde. I am not sure how this family is "ethnic," but I suspect they are hinting at a Latin background? very weird. At $16 this was an awesome buy to help me ensure my furniture was scaled correctly and I was tired of looking at my wood artist models. I did a photo shoot with Mini Me and Mini Miss Kitty. Photos aren't on this computer, so I will post them in the future. Mama's Got A Brand New Bed! I had a bed phobia. For some reason I had a mental block about being able to conceptualize building a bed and then a fear of where to start. It hit "do or die" time when I actually needed the bed to fill in the bedroom. Who knew a bedroom would require a bed? I had a look in mind so I went to a few websites and finally found measurements that seemed appropriate. Then, I measured it out to make sure the real life proportions were good too. My old friend Ikea was my go to for the mattress dimensions. I didn't do anything fancy for this bed, as the linens are stuck in place due to the toddler factor. I used 2 pieces of foam board, glued together, then wrapped in cotton batten. This is a platform bed, but I decided since Miss Kitty was playing with it, it needed to withstand dolls "jumping" on the bed and general wear and tear. So, no slats under the mattress! I used 2 pieces of 1/8" wood to form the mattress base of the bed. I made sure to make it large enough to accommodate the detail at the edges I planned and space for the linens to tuck into. I used a 3/4" square wood trim piece as the base for the platform to sit. I miter cut the corners. The base is wider then the platform because the platform will also act as the recessed detail on the bed frame. I then used another square 1cm wood trim piece to sit on top of the platform. Take a look at the pictures with the arrows!!! The platform is sandwiched between the 2 trim pieces. The top trim piece now act to hid the base of the mattress (and linen edges) and keeps the mattress from shifting. More views of the 3 piece wood sandwich! I then glued on a balsa sheet for the headboard and made little end tables attached to the headboard. The mattress now is snug as a bug between the upper lip of trim. No worrying if you can see the bottom of the linens or anything else you're trying to hide! Bed making phobia is GONE! Next up is the linens......sewing machine time!!!! As a side note, I am slow with blogging lately! Miss Kitty isn't even 2 and she's decided to start potty training. Then, I started a side project (with a mini component) that I will blog about, but its been a bit more consuming then I had intended. When aren't minis more time consuming then intended, right? And its GARDENING SEASON!!!!!! This is very exciting for me. But it has taken up some of my evenings (post Miss Kitty's bedtime) along with going to the gym more often. But you need to be healthy and alive to blog, so it all must be done. Therefore, I am blogging at a slower pace because I'm not making things as fast. This dollhouse was supposed to finished by now. Oh well! After the dresser and desk combo went in, I was worried (needlessly) that the room might look too traditional. Art, I thought, would breath some modern "umph" into it! I took to the pages of Style At Home and House and Home. The one picture is of a poster and the square art is actually a photo of a rug. I cannot say enough about using magazines when you at a loss for artistic inspiration. The printing holds up (you can spray them to preserve then further too) and if you horde a few months for of issues before you sit down and chop them up, then you likely have enough content that something will work. I cut my pictures to the same size. Then used regular white card stock and made mats for them the hardest part is cutting out the center rectangle and hoping that everything is straight and square (even when you use a craft knife and t-square). I then glued the mat to the picture and pressed it between 2 books over night. The frame is thin matchstick-like wood I got in a craft wood/popsicle stick box from the dollar store. The "glass" is just a bit of rigid plastic I saved from packing materials. Just have a look in your recycling bin! And I took the pictures in my new light box! Much happier with the results and much less swearing occurred. I stared at it. It stared at me. Everyone's kind comments were very appreciated. The rug idea played over and over. 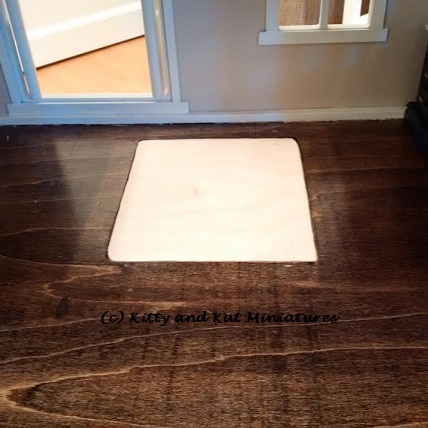 But then I realized Miss Kitty would take the rug out. Maybe use the rug to make a diaper for Elmo. This would not be a long term solution. I cracked out the saw and the Dremel. Done! Lesson: make sure your wood grain is running in the same direction. Why did you put the stairs in the middle of the floor? And why did you make such a HUGE hole on top of it? The giant stair opening never seemed an issue until I decided to make this a real dollhouse. When you have a giant opening for stairs in the bedroom and attic, where do you put the bed? This is what happens when you make a kiddie dollhouse a "real" dollhouse. The 2 stair openings were in the master bedroom and the attic. They were large because it allowed you to reposition the stairs to where you wanted them. Simple solid stairs that I had stained the treads and painted the risers white. I really try for realism, so not having stairs bugged me (still does). But I really didn't want to cut a new hole on top of everything else I was doing. So, I plugged those holes and secretly know the resident teleport between floors. Okay? Don't ask questions. Cut a larger (by at least one inch all around) piece of wood to act as a new ceiling piece and something for your floor piece to attach to. Paint the ceiling piece to match your current paint colour. Use green painters tape to keep it in place and prevent buckling. Let dry overnight! I didn't use heavy books on top because I didn't want to put too much pressure on it and cause the ceiling panel to push away from the actual ceiling. As I was wrapping things up, I thought, what was the most important thing about this project to stress to my readers? Yup. Well, I took the finished attic floor piece and popped it in and SURPRISE I didn't have the grain going in the same direction. It was horribly obvious and could not be saved. Total redo of that floor piece. You think I might have noticed it when I was sanding and fitting the piece? Ha. I even took a picture of it before I noted the error. The piece of the right is the incorrect grain. Didn't even notice it then!